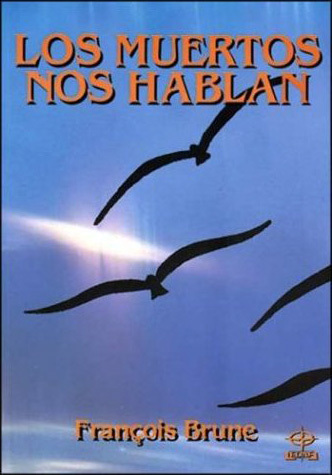 The French priest François Brune became known in Europe during the late 1980s thanks to a book entitled The Dead Speak to Us. In that book he stated that, by means of elaborate technological processes, it was possible to communicate with the realm of the spirits. 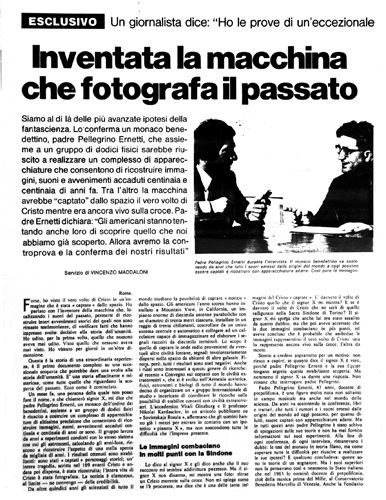 But Father Brune also knew about details relating to a certain machine that would photograph the past, designed in the 1950s by the Vatican. The Lady in Blue speaks extensively about this, but the following interview between Javier Sierra and Father Brune in Madrid reveals additional details on the subject. The month of October 2003 was one of the rainiest that I can recall. Just four days before the feast of All Saints, I was thinking that the date chosen by Father François Brune for our interview couldn’t be more appropriate. A small hotel in the heart of Madrid, close to the Plaza de la Ópera, served as the scene of our conversation concerning the Chronovisor and the work of the Benedictine Pellegrino Ernetti. An expert in pre-polyphony who served as inspiration for the character Giusseppe Baldi in The Lady in Blue, Ernetti had died in 1994 without my having been able to gain access to his secrets. I thought that perhaps Brune, a personal friend of Ernetti for many years, would be able to help me to find out more about the Chronovisor. 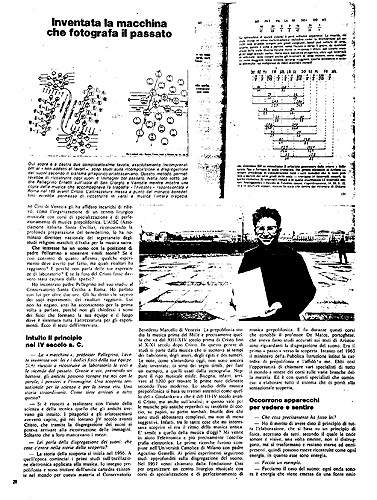 Brune had first met the Benedictine Father Ernetti in 1964, almost eight years before the latter’s story would appear in various periodicals. He even devoted an entire chapter of his 1990 book The Dead Speak to Us to Ernetti. 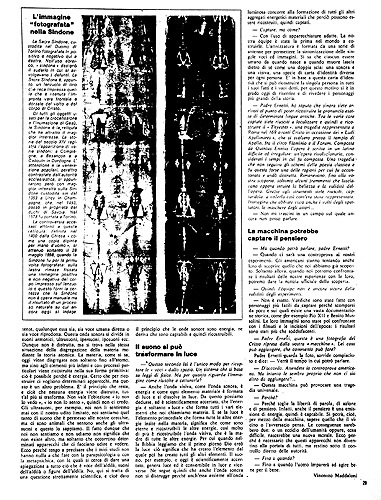 In it he combines the scientific Vatican project for capturing images and sounds from the past with matters more related to parapsychology, such as “psychophonies,” the controversial recordings of supposed voices from the beyond. I needed to know more. 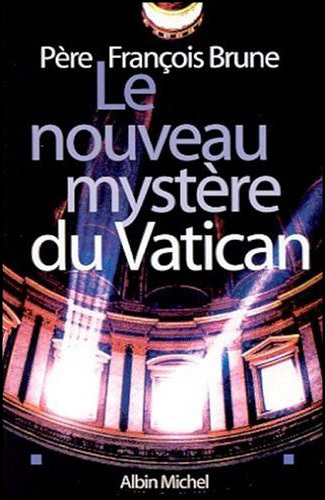 Much more than he had related in that book or even what he had revealed months before our meeting in another book devoted to the Chronovisor, The New Vatican Mystery. I wanted to know when in fact Brune had first heard of the Chronovisor project. What had been his impression of it. At 4:30 sharp, we were seated in the hotel “HH” in Madrid. Father Brune was dressed as a clergyman, but sporting sneakers. My question surprised him. I had decided to get straight to the point, and Brune seemed willing enough to speak. Brune’s face lit up. “Exactly,” he replied. “I saw Ernetti for the last time a few months before his death in 1994. He told me that they had just had a meeting in the Vatican with the last living scientists who had collaborated on its construction. There had been four cardinals and other scientists, and he told me that they had discussed all that they knew. The unfortunate thing was that Ernetti would only divulge the name of scientists once they were already dead. I found that funny. François Brune didn’t realize that the “reporter from the magazine Más Allá had been me. 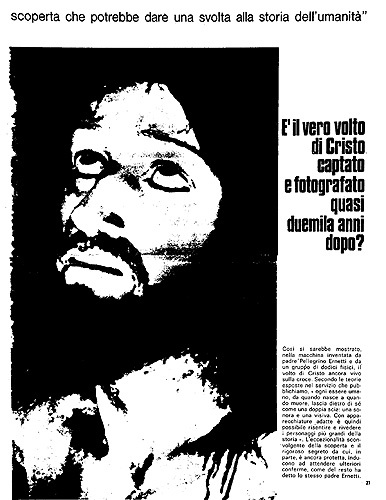 I had interviewed Pellegrino Ernetti one year before his death; and although he had not told me much, he had insisted that the alleged photo of Jesus had not been obtained from his equipment. At last the moment of truth had arrived. The moment when I asked Brune if, in addition to his priest-to-priest conversations with Ernetti, he had been allowed to see films or photographs from the Chronovisor. Brune was categorical. “No,” he asserted. “Ernetti told me that he hadn’t kept any of it. He was urged by his superiors not to speak a word about it. And he suffered a lot due to this, because he never had the occasion to explain his discoveries to Science. “Brune shrugged his shoulders at my naivete. Sierra makes it all entertaining, intermixing history, churchly intrigue, folklore, spycraft, musicology and conspiracy journalism.